This project builds upon my original one-button universal remote you can view here. I’m very grateful to my team’s experience, effort, and insight. I focused on the electronics and coding, but the 3D printing expertise, testing, and design ideas from other team members are what really brought everything together. As a team we were able to produce a polished and functional enough prototype in time to win the “Most Independent” award. In a later pass if we have time we may slim down the enclosure among other changes. It was only originally made that large to accommodate a large powerful speaker to be more easily heard during this loud event. Below are some pictures from the event and some high level build steps. Since IR only transmits line-of-sight (though it can bounce a bit), an important consideration is making sure your sent IR codes actually hit the IR receivers on the target devices (TV, cable box, etc). This is especially important to consider since unlike a typical IR remote usage scenario, our users are not able to easily re-point the remote until it works. To address this in the different environments our device may be used in it can be configured in one of two modes. In stand alone mode, many high power IR LEDs are installed around the edge of the device pointing in different directions so that at any angle there will be some direct (or almost direct) path to the piece of electronics being controlled. This can be a workable solution and is employed by many IR blaster devices including Logitech Harmony. In satellite mode, the central remote (which does move around with the user) sends the timings of the intended IR code over RF to “satellite” transmitters which are stationary, well placed and aimed to send the actual IR codes. These modes are selectable at compile-time in the code. When building the hardware you can wire up only the version you intend to use, or both. OneButtonRemote contains code running on the Teensy 3.5 board of the main remote. 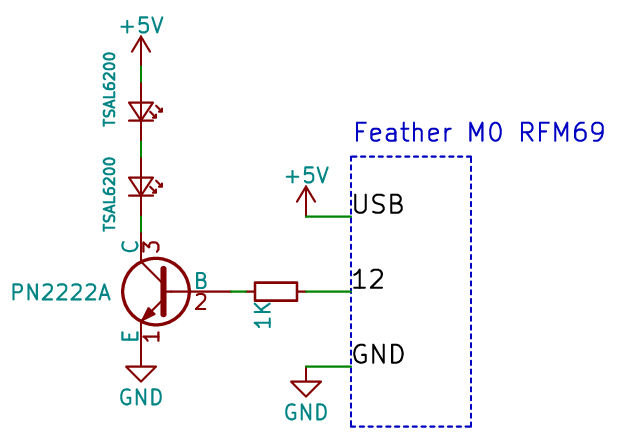 rf69_IR_transmitter contains code running on the Feather M0 RFM69 boards of any satellites you want to set up. config/demo contains files for the SD card, most important file being config.txt. config.txt (which has instructions at the top) holds all the configuration for the menus. This device can be configured to control and number and combination of IR electronics in the person’s home including but not limited to TV, DVD player, cable box, radio, many ACs, etc. As such you need to choose what menus and menu options you want. As mentioned, when you build the OneButtonRemote you have 2 options for IR transmitters depending on preference and need. Again, note that IR transmits line-of-sight (with some limited bouncing off objects). The option is selected at build time from the file IR.h. The first define, as enabled here, means that the remote itself transmits the IR. If that define is commented out and the other is uncommented then IR timings are sent over RF (no line-of-sight restriction) to satellites which handle sending the IR and should be positioned optimally. There are 2 main steps to configuration after you have physically assembled the device: customizing configuration within config.txt and recording the actual IR codes onto the SD card. Instructions for configuring config.txt are at the top of that file. Hit enter to make sure you have a working prompt “:”. Confirm in the terminal that it is ready to record the IR code. Press power on your TV remote while pointing it at OneButtonRemote’s receiver. Confirm you see the recorded timings in the terminal. Test by typing “play tvpow” and watch to make sure that the TV responds by toggling its power. Note: many newer TVs must first fully boot before responding to being turned off. They will ignore a power command if sent too soon after turning on or in some cases off. In the above example a file named tvpow (note filenames are limited to 8 characters) was created and stores the IR timings for the TV power command. The name can be of your choosing and does not affect operation. The only important factors are the 8 character limitation, and that you exactly match the spelling you used in config.txt. In config.txt specific IR files are linked to specific menu options. The code builds in the Arduino IDE but you will need to do some setup for these boards.